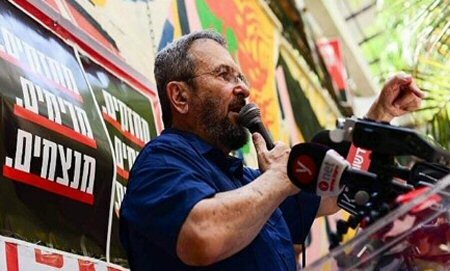 Former Israeli prime minister Ehud Barak has censured his successor Benjamin Netanyahu for passing corrupt legislation, comparing him to Romanian dictator Nicolae Ceausescu, who was overthrown and killed in 1989. “The moral collapse of Netanyahu has begotten laws whose only purpose is to help the government escape the corruption, bribery and breach of trust affairs it is suspected in,” Barak said at a speech in Tel Aviv, Sunday. Barak hinted that Netanyahu would face the same fate of Ceausescu, who ruled over Romania with an iron grip, from 1965 until he was overthrown after mass protests against him. He was executed in the same year, along with his wife Elena. “It’s an expression of moral degradation that is not working for the good of citizens but for submission to a seemingly corrupt leader. This is reminiscent of Elena and Nicolae Ceausescu more than a model society or a light unto the nations,” he said, according to Press TV/Al Ray. Commenting on Barak, Netanyahu’s Likud Party said, in a statement, that the former prime minister was “inciting murder” against the premier. “He’s simply lost it,” the statement added. Netanyahu is currently embroiled in three corruption cases, though he has not been indicted. A number of laws passed recently have been thought to be attempts to protect him, such as a law that will prevent police from publishing recommendations on whether to charge criminal suspects. Barak, who is thought to have aspirations of returning to political office, has been a vocal critic of Netanyahu and urged him to step down in the past, over the corruption probes. In response to Likud’s charge, Barak hinted, on Twitter, at charges that Netanyahu had engaged in incitement to violence ahead of prime minister Yitzhak Rabin’s assassination, in 1995. Prior to the assassination, Netanyahu, then only the leader of the extremist Likud party, had accused Rabin of being “removed from Jewish tradition… and Jewish values.” Rabin, in turn, had accused Netanyahu of provoking violence.